A native Israeli, I have been living in Tel Aviv since 2013. 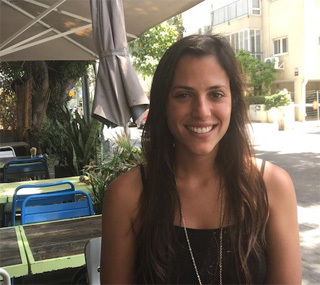 After having lived in Philadelphia for two years, I moved to Tel Aviv and have been working at a non-profit that aims to create a more just, equal and pluralistic society in Israel. I oversee international programs and host hundreds of visitors that live and volunteer in Tel Aviv. My job includes guiding tours in South Tel Aviv, learning about the diverse population of migrant Jewish workers and asylum seekers from Africa, and discussing the economical and social challenges the residents of the neighborhood are facing. I am passionate about traveling and exploring cities around the world and what food and trendy spots they have to offer. My job allows me to work remotely and as a result I find myself walking all over Tel Aviv with my laptop, looking for fun places to spend my day at! I love Tel Aviv because it embodies what Israel is all about: it is challenging, exciting, innovative,diverse, interesting, misunderstood, subjective. Tel Aviv is anything but one-dimensional and people relate to it differently, but all fall in love with it eventually. Tel Aviv is inspiring in so many ways; I am lucky to call it home and to be sharing it with you!